Beauden Barrett (Taranaki) has followed in his fathers footsteps to become one of New Zealand brightest young stars. 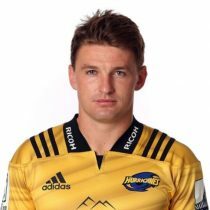 After a decorated junior career which saw him win the IRB Junior World Championship, Barrett joined the ranks of the Hurricanes, making his Super Rugby debut in 2011. Blessed with great pace, and an eye for a gap, the electric fly half also possesses a great rugby mind, showing on numerous occasions the ability to orchestrate and control a game. After a string of impressive performances in the Super Rugby competition, Barrett joined up with the All Blacks senior squad, making his debut in the victory over Ireland in 2012. A mercurial player, Barrett was New Zealand’s top individual points scorer in the 2014 Super Rugby competition, with 209 points for the season. He was in similar impressive form for the All Blacks in 2014. He continued his sublime form in 2016, re-signing for New Zealand, Hurricanes and Taranaki until the end of 2019. In November 2016, Beauden was named World Rugby Player of the Year 2016, following his impressive performances for the Hurricanes and the All Blacks. The attack-minded player, equally at home at fly-half or full-back, has scored seven tries in 2016 with defences often left flat-footed by his step and turn of pace. Following a drawn Test series against the B & I Lions, the 53-times capped fly-half will hope to steer the All Blacks to another Rugby Championship. Barrett captained the All Blacks for the first time in the non-capped victory over the Barbarians in November. The Two-time World Rugby Player of the Year took his Super Rugby cap tally to 98 and has scored 1 050 points by the end of the 2018 season. He entered the 2018 Rugby Championship with 65 test caps. In the second test against the Wallabies, Barrett put in a performance that has been tipped as one of the finest performances by an All Black and has been compared to that of Dan Carter's against the British and Irish Lions. He scored 4 tries and 5 conversions as the All Blacks beat the Wallabies 40-12 at Eden Park. Ahead of the 2018 November International, Barrett has obtained 69 test caps.